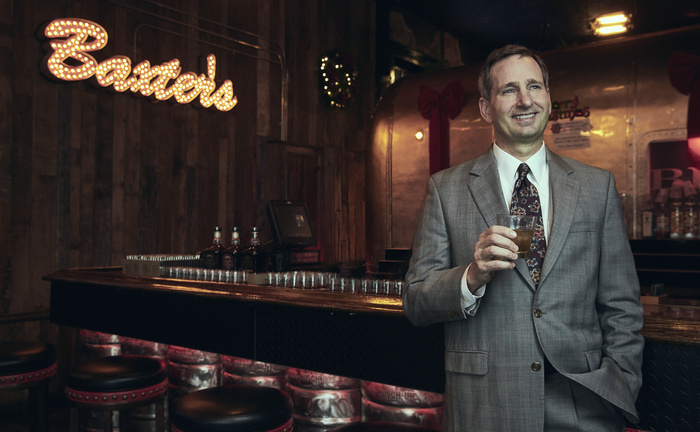 Portrait of Bruce Corwin, founder of the Bourbon Brotherhood. Based out of Louisville Kentucky, the Bourbon Brotherhood meets once a month at a different location to eat good food, drink good bourbon, network, and just have a good time in general. This was shot minutes before one of their meetings in Baxter's 942 Bar and Grill. I've discovered a newfound love in portraiture recently. With this particular image I tried to use as much ambient light as possible so I dragged my shutter to 1/50th of a second (without a tripod). I had a 46 in softlighter camera right as my key with a 63 in fill behind me (it was super dark in here). Naturally I didn't have any cto so my image came out SUPER warm in the background, but with some creative color grading I found a nice balance with the fore and background colors. Great separation of different color temperatures. Thank you! There was A LOT of masking and equal amounts of color grading.